The Georgia Force knew they could beat the defending Arena Bowl champions because they have done it twice during the regular season. The Force also knew that their game against the Jacksonville Sharks on Saturday night would be a challenge because the winner of the game would advance to the American Conference championship. It was a game that both teams will remember because it had a thrilling end. But the Sharks are the team that will have better memories after kicker Marco Capozzoli kicked a 51-yard field goal with no time left to give the Sharks the 58-56 win. Capozzoli and the rest of the Sharks did not think it would come down to a field goal after taking a 34-21 lead into halftime. Quarterback Bernard Morris threw four touchdowns in the first half and Josh Philpart scored on a 2-yard run early in the second quarter. The Force actually led early in the first quarter when Bryant Moniz threw a 28-yard touchdown pass to C.J. Johnson to give Georgia a 7-6 lead. But the Sharks would go on to score 21 straight points to carry momentum into the third quarter. Morris would score a 1-yard touchdown run to open the third, giving Jacksonville a 41-21 advantage. The Force would attempt a field goal on the ensuing drive but would miss. The Sharks would take advantage with a 30-yard Morris touchdown run to push the lead to 48-21. The Force drive would turn out to be a costly one on multiple fronts. Not only did the Force miss an opportunity to add points on the board, Moniz would go down with an ankle injury and would not return to the game. Darnell Kennedy took the place of Moniz, and he gave the Force the spark that they needed. Thanks to three touchdown passes by Kennedy and timely defensive plays by Caleb Bostic and Ahmad Hawkins, the Force cut the deficit to six early in the fourth quarter. Jacksonville would answer back as Morris threw a 2-yard touchdown pass to Jeron Harvey to increase the Sharks lead to 13. But three minutes later, the Force cut the Sharks lead back to six when Benji McDowell scored on a 1-yard touchdown run. After forcing the Sharks to turn the ball over on downs, the Force stuck back as Kennedy threw a 12-yard touchdown pass to Mike Johnson, giving the Force the lead with one minute left in the game. That was enough time for the Sharks to move the ball down field and into range for Capozzoil. He nail the 51-yard field goal, the longest in franchise history. 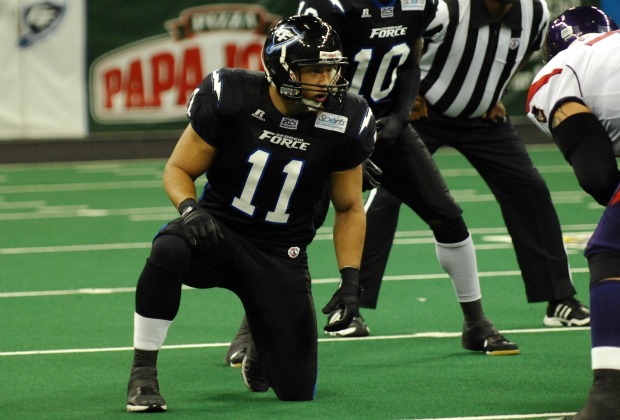 The Force ended the 2012 season like the 2011 season: being denied a chance at an Arena Bowl by the Sharks. It was an up-and-down year for the Force due to inconsistent quarterback play and numerous injuries. However, head coach Dean Cokinos was able to keep the team together and reach the playoffs for the second consecutive season. Now Cokinos and the rest of his staff will have to focus on the 2013 season and see what they can do to get over the hump and reach the ultimate goal.